공주시 금성동에 있는 웅진 백제시대 왕들의 무덤이 모여있는 곳이다. 무령왕릉을 포함한 이 일대의 고분들은 모두 7기가 전해지는데, 송산을 주산으로 뻗은 구릉 중턱의 남쪽 경사면에 위치한다. 계곡을 사이에 두고 서쪽에는 무령왕릉과 5 ·6호분이 있고 동북쪽에는 1∼4호분이 있다. 1∼6호분은 일제시대에 조사되어 고분의 구조와 형식이 밝혀졌고, 무령왕릉은 1971년 5 ·6호분의 보수공사 때 발견되었다. 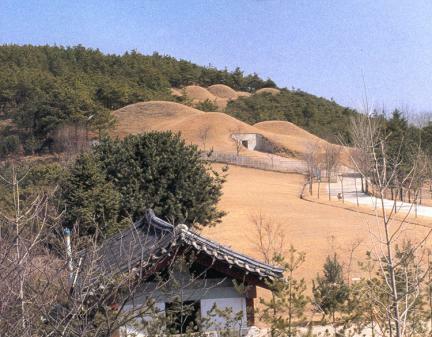 고분들은 모두가 표고 약120m 정도되는 송산(宋山)을 북쪽의 주산(主山)으로 한 중턱 남쪽경사면에 자리하고 있는데, 1∼5호분은 모두 굴식 돌방무덤(횡혈식 석실분)으로, 무덤 입구에서 시신이 안치되어 있는 널방(현실)에 이르는 널길이 널방 동쪽벽에 붙어 있는 것이 특징이다. 1∼4호분은 바닥에 냇자갈을 깔아 널받침(관대)을 만들었는데, 5호분은 벽돌을 이용하였다. 이처럼 같은 양식의 무덤이면서 구조와 규모에 있어서 약간의 차이가 나는 것은 시기 차이가 반영된 것으로 보인다. 5호분은 원형으로 남아 있으나, 1∼4호분은 조사되기 전에 이미 도굴되었다. 이외에 벽돌무덤(전축분)으로 송산리벽화고분이라고도 불리는 6호분과 무령왕릉이 있다. 6호분은 활모양 천장으로 된 이중 널길과 긴 네모형의 널방으로 되어 있는데 오수전(五銖錢)이 새겨진 벽돌로 정연하게 쌓았다. 널방 벽에는 7개의 등자리와 사신도 · 일월도 등의 벽화가 그려져 있다. 무령왕릉도 6호분과 같이 연꽃무늬 벽돌로 가로쌓기와 세로쌓기를 반복하여 벽을 쌓았다. 벽에는 5개의 등자리가 있고, 무덤주인을 알 수 있게 해주는 지석 등 많은 유물이 출토되었다. 6호분과 무령왕릉은 현재 남아있는 백제의 벽돌무덤으로, 모두 터널형 널방 앞에 짧은 터널형 널길을 가지고 있으며 긴 배수로도 갖추고 있다. 이러한 형식의 벽돌무덤은 중국의 영향을 받은 것이며, 벽화는 고구려의 영향을 받은 것으로 보인다. 특히 무령왕릉의 경우 확실한 연대를 알 수 있어 백제사회의 사회 ·문화상을 연구하는데 절대자료로 평가된다. 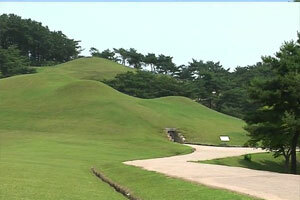 Located in Geumseong-dong, Gongju, these are the tombs of the Baekje Dynasty. 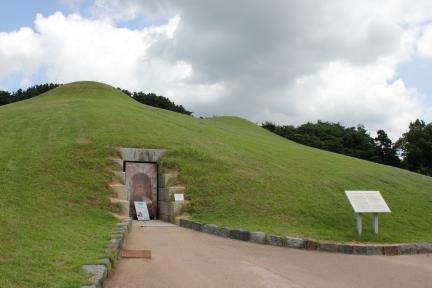 The seven tombs located on the southern slope of Songsan Mountain are of Baekje kings including King Muryeong. 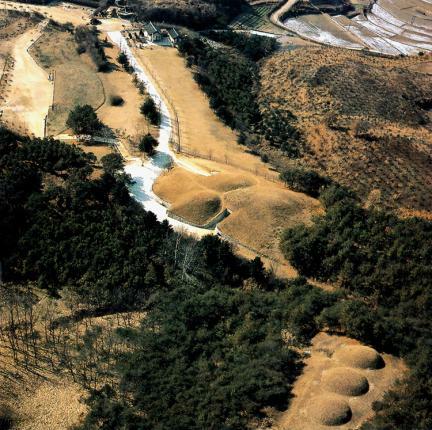 Among the seven royal tombs, three were excavated west of a valley (Nos. 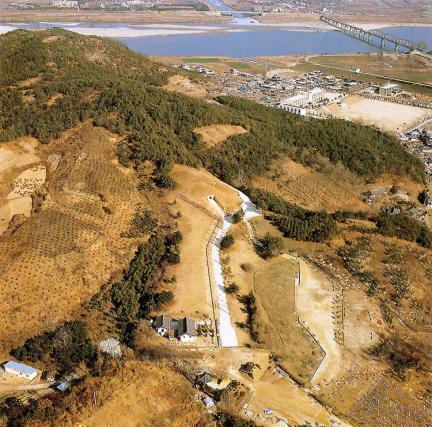 5-6, tomb of King Muryeong), and four, in the northeast (Nos. 1-4). 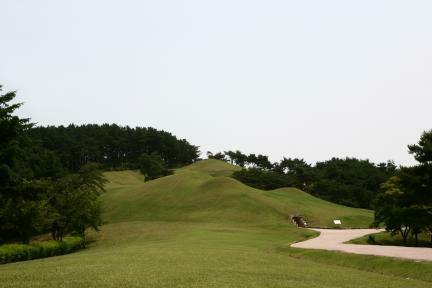 These six were excavated during the Japanese colonial rule, while the royal tomb of King Muryeong was found in 1971 during the repair work for Nos. 5-6. Tombs numbered 1-5 are of the stone chamber tomb with tunnel entrance type. The walls of the chamber are plastered, and the coffin base is made by laying pebbles (Nos. 1-4) or bricks (No. 5). When the excavation work started, Tombs 1-4 had already been burgled, but Tomb 5 was intact. 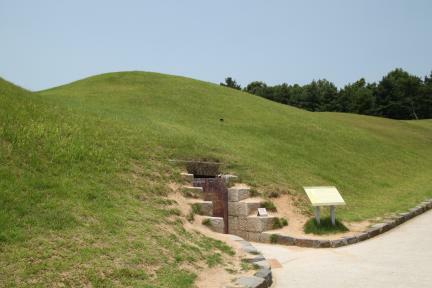 Tomb 6, often called Mural Tomb in Songsan-ri, is of the brick chamber type. 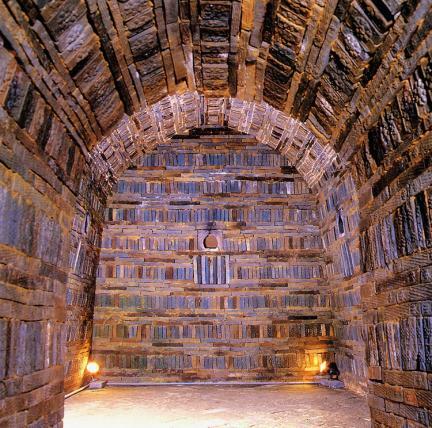 It has a rectangular chamber whose walls are decorated with mural paintings of stars, sun, moon, and gods of death. 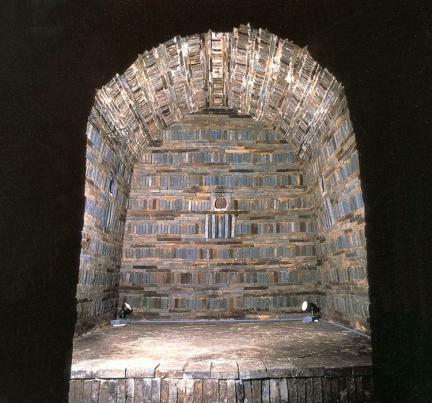 Another brick chamber tomb, which is that of King Muryeong, is decorated with lotus patterns and painting of the stars. There, archaeologists found many relics including a stone monument with inscriptions on the dead person. 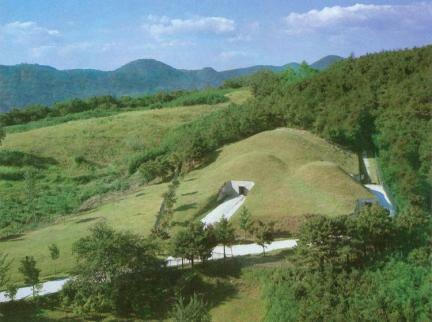 Influenced by China (tomb type) and Goguryeo (mural painting), the tomb is regarded as a precious asset for the study of Baekje society.